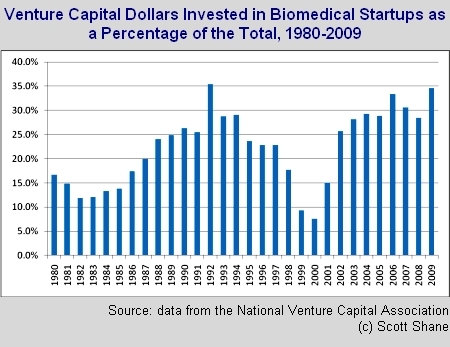 Over the past few years, venture capitalists have made a lot of investments in the biomedical sector. A recent blog post by CB Insights explained that biomedical deals have grown dramatically since 1998, reflecting a 13-year trend towards investment in that sector. While venture capital investments are more concentrated in the biomedical sector today than they were in the late 1990s, focusing on the rising trend since that time fails to put investors’ interest in historical perspective. As the figure below shows, 2000 was the low point for venture capital focus on biomedical ventures because it was the height of the dot-com bubble. Looked at over a longer time horizon, venture capital investment in the biomedical sector simply appears to have rebounded from an abnormally low level. 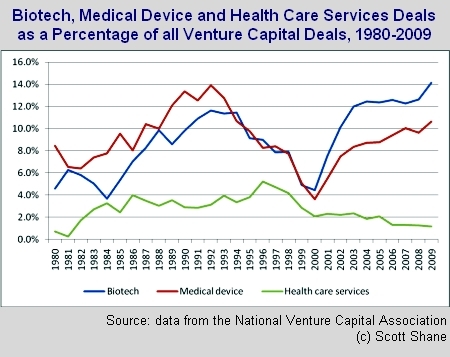 What types of deals are driving the biomedical sector’s return to its historical share of venture capital? 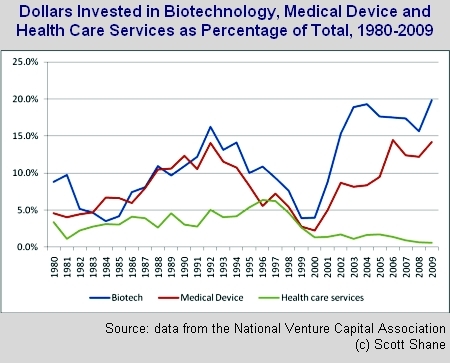 CB Insights argues that “the strength in healthcare investment has been driven largely by venture capital investment in medical devices and equipment.” I’m not so sure. True, medical device deals have grown a lot since the end of the dot-com boom. But since 2000 they have grown more slowly than biotechnology deals, as the figure below shows. This subsector’s share of venture capital deals is now at its highest level since 1980, hitting 14.2 percent of all investments in 2009. 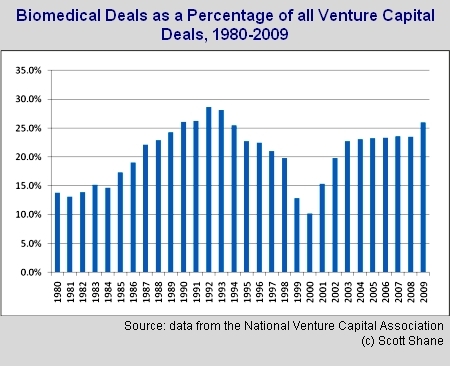 The real laggard has been health care services, which has accounted for a declining share of venture capital deals since 1996. As the figure below shows, the patterns are similar when measured in terms of share of dollars rather than share of deals. Since 2000, biotech has had the highest growth on this measure of any biomedical subsector, hitting a record share of dollars invested last year. In short, the story of investment by venture capitalists in the biomedical sector seems different from what has been told elsewhere. The share of venture capital investment in this sector is returning to pre dot-com era levels from an abnormally low point. While medical devices are part of that resurgence, the growth is also being driven by biotechnology, with only health care services being left out of the picture.